Discussion in 'Razors, Scissors, & Personal Grooming' started by KillerGriller, Feb 4, 2019. Got me a decent Wade & Butcher straight razor a while ago, but the edge needs some love. 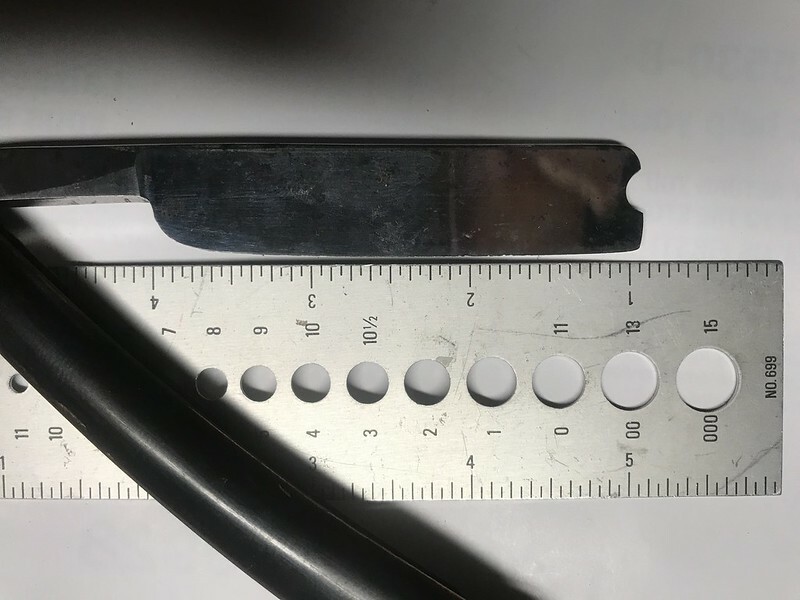 It doesn't show up in the pics, but there's a rough spot in the middle of the blade that will probably need a good heavy sharpening or filing to work it back into a functional shaver. I'm looking for some suggestions on the best way to approach it? Profile is important, you need to make sure you keep the edge square, or smiling, there should be a very subtle arc the entire length of the edge. What you certainly don't want is to get it frowning. You can either just start reprofiling, 800 waterstone is going to take a lot of time, and it looks heavy so a 400, or even 220 should be okay if you are gentle. The thinner the overall blade profile, the finer you want to keep the stones. That one looks pretty wedgey, is it a half hollow? I can't tell from the pic angle. If its near a full wedge, 220 will do the job. Courser hones may also leave more scratches from stray grit. If you are worried about wear on the spine, you can tape it, but keep in mind the spine is supposed to wear as the blade is sharpened, so its up to you. Try to get as clean an edge as you can. Shortcuts don't really gain you much as the fine hones take nearly nothing off. After 4k, all it is is polish. One note, its possible to get deep corrosion, you may have seen it referred to as crumbly steel. It will take a shaving edge, but under the lateral stress of shaving will go ragged again, so take it through the grits to 8k, and try to shave with it, just a patch, to ensure that you are in good steel. If it holds, then go finish it however you like. 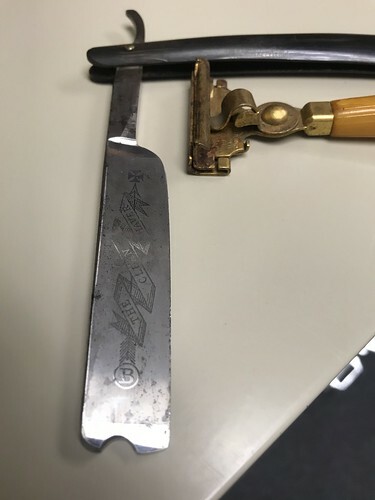 Other options, you can breadknife the edge on a stone (use the end or a stone not needed for honing) and take the edge all the way back to good steel before rebeveling, if you are not careful, you can frown a blade pretty easily I'm told. 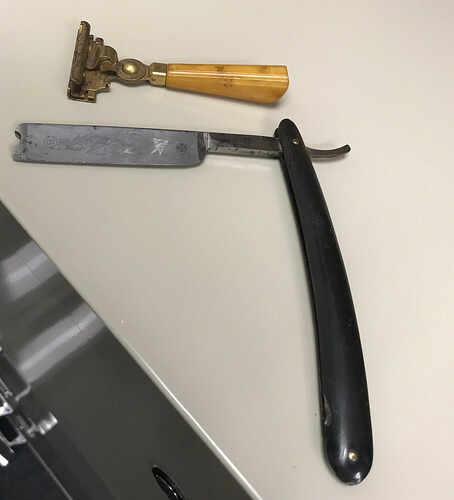 Hopefully this makes some sense, I've not done too many razors but I've gotten a few antique store gems to shave. KillerGriller and Lapedog like this. That looks like a near wedge. It's going to take some work to get that out. Do NOT touch that razor with a steel file or you will destroy the file teeth. If you are new to straight razor sharpening I would recommend sending that out to someone with more experience. That will turn out to be a really nice razor if it's done right. If you have the experience to do it yourself, make sure to NOT concentrate only on honing the damaged area, or you will create the frowning edge mentioned above. With wedges and near wedge like this, it is often helpful to use a little bit of tape on the spine to thicken it a bit to reduce hone wear. 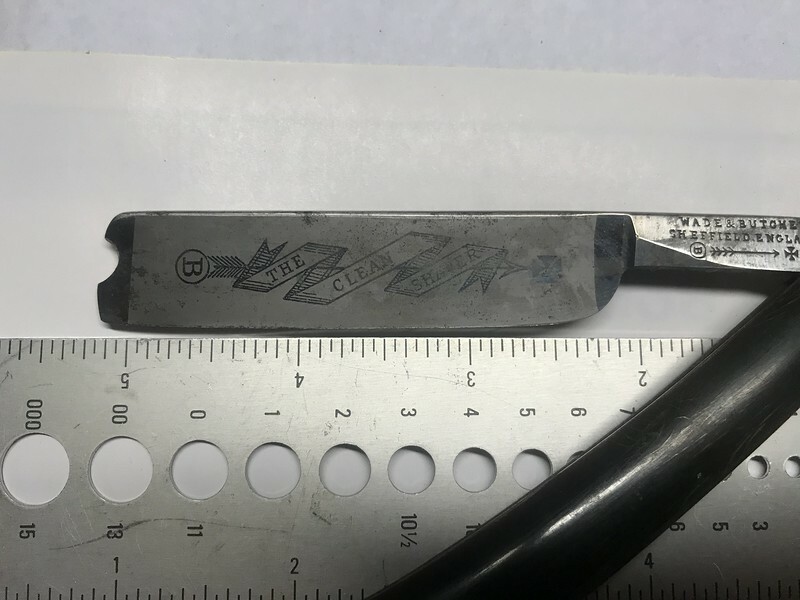 Since there's very little hollow on these types of razor, the hone wear surface area gets pretty big pretty fast otherwise. 1000 grit to set the bevel. 2000,4000,8000 progression. nothing coarser than 1000 to start. it isn't a knife one layer of tape on the spine keeping the blade flat on the spine against the hone. it takes a special sweep to keep the profile of the blade. I have 2 wade and butcher wedges with a ship etching exactly like it, also a joseph Rodgers with the same style blade with I am a #1 etch. honed properly they shave really nice. anything coarser than 1k you will loose the shape if you are not very experienced with a hone. also remember using tape will change the angle as the blade gets thinner the spine should also get thinner since the angle on a straight is set from the spine. wades take a fine edge from a coticule. Thats pretty close to the profile I'd expect, its not smiling a huge amount and is certainly not a frown which is what we don't want. Even a full wedge is rarely a flat sided blade since they were nearly all ground on very large wheels, (but not all, some were ground on table grinders) but that looks pretty wedge-y to me. Shouldn't be too bad to knock that edge back into shape if you want. Yes it will be the equivalent of a lot of years of wear, but so what?